For the past four years, second-year BBA students have been invited to participate in the IKEA Sustainability Challenge. The challenge provides students with an opportunity to showcase both their innovative thinking and their passion for social and environmental sustainability in business practices. This year’s challenge launched on Nov. 7 when Melissa Mirowski, Country Sustainability Specialist at IKEA Canada, joined Lazaridis School students to announce the challenge question and engage in a Q&A session. The challenge question posed to the students was how IKEA Canada can engage more closely with its communities to co-create more sustainable social and/or environmental outcomes. Students were asked to consider this through the lens of social, environmental and economic impact, community involvement, storytelling opportunities, and co-worker engagement opportunities, while aligning with IKEA Canada’s strategy and brand positioning. Teams had one week to develop and submit their written proposals to a selection committee. Nearly 50 teams entered the challenge, making the task of selecting the top 25 proposals a daunting one. The top 25 teams had the opportunity to visit the Burlington IKEA location for a tour and to learn more about their business practices. This insight helped them further develop their proposals and refine their presentations for video submission. The videos were then judged by independent sustainability experts and the five finalist teams were announced. All finalists receive scholarship funding from IKEA Canada and the members of the winning team will each be invited to a lunch and interview with IKEA executives for a summer internship or co-op position. Barry Colbert, Associate Professor, Policy; Director, The Cooperators Centre for Business and Sustainability at Wilfrid Laurier University. The first of five teams to present was ‘The IKEA Idea’. 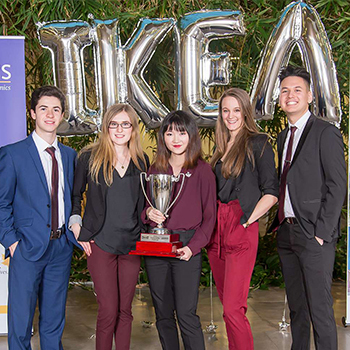 The team introduced a proposal for IKEA Canada to partner with high schools near IKEA locations to develop sustainability challenges using employee mentors, that would help build a generation of more sustainably minded leaders, with the prize being a sustainable retrofit of their school. They were followed by ‘Happy Homes’, a program designed to support the more than 78,000 children in the Canadian welfare system to improve the physical and mental health of those living in foster care through custom room design to create a space they could feel more at home. ‘Opening Doors Through Literacy’ showed a direct connection between early age literacy and academic success. In Canada, 30% of grade three students lack basic literacy skills, affecting their ability to analyze and apply their learning. They proposed IKEA could improve literacy skills through a community collaboration and partnership with Frontier College, as well as providing access to books through IKEA community book stops and a #stocktheshelf campaign. The team showed that a one per cent increase in literacy can lead to a $32 billion increase in the economy and suggested that IKEA could play a role by improving libraries in low-income neighbourhoods. ‘Enercart’ designed a device that uses the motion of shopping carts to recharge battery cells that are then collected and used to power the IKEA store. Using habits that the shoppers already have, the program would allow consumers to quantify their energy production as well as connect it to their IKEA account to track, share and earn rewards. This initiative links directly to IKEA’s goals to consume net zero energy by 2020. The final presentation was from the ‘IKEA KITE Project’, a group aiming to make play equitable for all. Through partnerships with Kaboom and EnergyFloors, IKEA would improve playgrounds in under-served neighbourhoods and collect power from the kinetic energy of play and the solar energy in the playground area. Judges were impressed by not only the ideas presented and their alignment with the IKEA brand initiatives, but also the professionalism of our students and the quality of their presentations. Congratulations to our finalist teams and thank you to all who participated in the 2018 IKEA Sustainability Challenge!